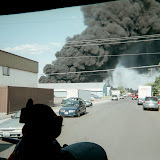 NARRATIVE: The City of Spokane Fire Department had a very busy day on 07/06/07, with several fire incidents taking place. Here are the highlights of each. At 1659 hrs crews of the Spokane Fire Department responded to 2727 E. 53rd upon report of a structure fire. First arriving crews found four units of an apartment building heavily involved in fire. Several apartment buildings surrounded the units on fire. With winds coming from the west and the fire in the east most portion of the involved structure, another nearby apartment building was endangered. SFD crews were able to protect the surrounding apartment buildings by advancing exposure protection leads. In addition crews held the main body of fire to the four involved apartments. Other units in the building also suffered some fire, water and smoke damage. Fire crews did an outstanding job of limiting the spread of the fire in this incident. After extinguishment of the main body of fire, firefighters remained on scene throughout the night to monitor conditions. Firefighters will continue to be on scene today to assure that the fire is out. The cause of this fire is still under investigation. One firefighter was injured during this incident. He suffered a leg injury when falling debris hit him. He was transported to a local hospital, treated, and did not return to duty. The injuries did not appear to be serious. No injuries were reported to civilians. Several pets did die during this incident. The next fire incident occurred at 0018 hrs at 1107 N. Freya. This is a one story, masonry, commercial structure. The business is "Blue Ribbon Linen Supply". They specialize in linen and uniform rental service and in janitorial chemicals and supplies. First arriving crews found light smoke coming from the structure. SFD members advanced pre-connected hose-lines into the structure and found several carts of business goods on fire. Firefighters quickly extinguished the fire and removed fire damaged goods from the building. Fire damage was confined mainly to goods on the carts. Minor fire damage occurred to wall and ceiling surfaces in the area near the fire damaged carts. Smoke damage was evident throughout. Firefighters were on scene for approximately one and one half hours. No injuries were reported to firefighters. This fire will be investigated today. No cause has yet been determined. At 0506 hrs on 07/07/07 units of the SFD responded to 1804 E Sharp upon report to a garage on fire. Smoke from the blaze could be seen from down-town. First arriving units found one garage fully involved in fire and the fire had ignited a nearby car and another garage. Firefighters used pre-connected hose-lines to quickly extinguish the blaze. The first garage was a total loss, with none of it remaining standing. The nearby car was also a total loss. The second garage suffered only minor damage. Fire investigators will be looking over this scene today in an attempt to determine the fire cause. No injuries were report at this scene. After this busy night firefighters will try to catch their breath and prepare for any upcoming emergencies. With continued dry weather, and hot temperatures fire danger will remain high. PROBABLE CAUSE: All incidents are under investigation.